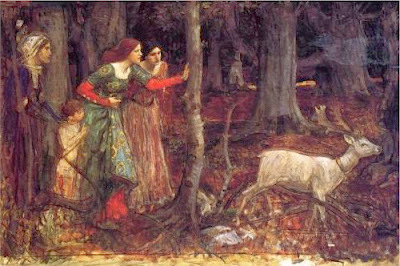 Living Liminally: Why Do We View Fairies As Nature Spirits? It's a widespread idea at this point particularly in modern paganism and popular Western culture that fairies are nature spirits, that is that they are intrinsically bound to our natural world in some way. This idea is often simply stated as fact, implied to have always been true, or even argued as the older or more legitimate belief. In paganism its one aspect of a current trend I'm seeing to homogenize and simplify fairies by defining them as easily as possible, erasing all the nuances and complexity that we find in the actual folklore and beliefs. It's so pervasive that I felt it necessary awhile ago to make a Youtube video addressing the confusion between fairies and nature spirits but I thought it might also be good to write a bit about it. I'm not telling anyone what to believe but what does bother me is seeing people claiming that the idea of fairies as spirits of nature is ancient, from a Celtic culture, or in line with folklore. Of course there are examples of beings that we might now classify as fairies from various cultures - I'm looking at you Greece and Rome - that are heavily tied into nature and might fit the description of a nature spirit. Dryads and Naiads are often mentioned, whether they should properly be considered nature spirits or not I don't know (I don't know enough about how they were understood in classical thought) and Genii Locorum [spirits of places] get tossed in there as well. The Norse landvaettir may also be considered nature spirits by some reckoning, although again whether they fit the more modern concepts of a nature spirit the way that popular culture envisions flower fairies or modern pagans muddle elementals into it is an open question. So what then is a nature spirit? I don't think there is any one agreed on definition of this term which is used rather nebulously by different groups. The most basic view of course is that a nature spirit is a spirit of nature, that is a spirit which inhabits or ensouls any natural object or phenomena. The world around us then is full of spirits, large and small, which most humans are simply oblivious to. Nature spirits are sometimes confused with the Indian concept of a Deva (literally divine being) or with the early Renaissance idea of Elementals (beings existing within specific alchemical elements), but again both of these terms are not directly synonymous to nature spirits anymore than fairies would be. What is a fairy? At its most basic a fairy is an Otherworldly being, although the term is often applied more to such beings from the Celtic cultural milieu than elsewhere. The word is also often used as an adjective, hence 'fairy woman' (bean sidhe), fairy godmother, or fairy hound to describe a more specific type of being that is from Fairy/the Otherworld. While the term in modern contexts has started to take on a very specific application in some areas thanks to mass media of a small winged female sprite its wider use is still inline with the older definition which can be seen across the last 700 hundred years or so. Many, many different kinds of Otherworldly beings that are known in folklore and anecdotes under specific names from Brownies to Urisgs, from Bean Sidhe to Each Uisce, would fall under the wider term of fairy. While many modern pagans and some non-pagan academics may view fairies, in toto, now as nature spirits that is definitely not how they have been understood across history, although as noted some nature spirits do fall into the wider definition of 'fairy'. Rather from its inception in the 12th and 13th centuries the word fairy was applied to beings from the Otherworld (i.e. the world of Fairy) that is beings who were inherently not from the human world. Fairies could pass between the human world and their own world as they chose to, could be seen or be invisible, could - in fact were known to - change their habitations regularly. They were even known to emigrate across oceans with populations or individuals something nature spirits cannot do being bioregion specific. While they may defend natural locations or things like a tree or boulder this is never done because its a tree or boulder but because it belongs to the fairies, or put another way it isn't based on a desire to protect the environment generally but out of territoriality (the same as humans fighting over territory will defend what they perceive to be theirs). As often as we see stories of fairies defending a fairy tree we see stories of them striking a person down for building on a fairy road or fouling a fairy well; its the violation of their possession of a space not the natural world they are angry over. Victorian Era - The Victorian era ran from roughly 1837 to 1901, encompassing the reign of British monarch Queen Victoria. It marked a period that included the end of the Industrial Revolution and many social changes including the growth of the middle class in both the United States and Britain. This period is notable for its romanticism of nature and the natural world, poetic appreciation of paganism and pagan themes, and its radical re-envisioning of fairies in art and literature. Victorian culture, divorced from actual belief in fairies, instead made them the fodder of entertainment infantilizing them, diminishing them, and gentling them in character and appearance, among many other things*. Theosophy - beginning in the last quarter of the 19th century Theosophy was the precursor for the 20th century New Age movement and drew on concepts from Gnosticism, Neoplatonism, and Rosicrucianism. It forwarded an understanding of fairies drawn from a blend if contemporary cultural romanticism of nature (see previous point) and the 15th century alchemical classification of fairies as elemental beings. Combining these two concepts resulted in a view of fairies as tied to natural elements and strongly connected to the natural world. Edwardians - following the Victorian era we move into the Edwardian, and we see a continuation of the shift in fairies in mainstream culture. JM Barrie's Peter Pan play and book are released during this time and the infamous Cottingley fairy pictures begin at the end of this era; both typify the way that modern popular culture has come to view fairies as small, fairly harmless**, and connected to the natural world in dress, home, and appearance. Immediately following this period we see Cicely Mary Barker's Flower Fairy books emerging which crystalize all of the previous influences into a single form: the fairy as small nature spirit. 20th Century Pagans - moving into the later 20th century we find these previous influences taken into different corners of paganism and appearing in diverse books. Fairies are defined as spirits of nature, often directly conflated to elementals using the classical alchemical system, and sometimes further seen as guardians of nature and guides to human evolution and right relationship with the earthly world. This modern view of fairies as nature spirits then is one that has been woven across the last 150 years or so initially coming from groups who did not necessarily believe in fairies but were indulging in a need for entertainment using fairies as the players on the stage, taken from there back into belief, then out again, then back in. This process has largely divorced the fairy-as-nature-spirit from the folkloric fairy, and even perhaps the actual nature spirits from the popular culture ideas of nature-fairies. Ultimately we can perhaps argue that some fairies are nature spirits, given how loose the definitions of both terms are, but it's an egregious oversimplification to say that all fairies are spirits of nature. We can also say that people who are seeking nature spirits and calling them fairies are getting nature spirits and this undoubtedly adds to the current muddy waters on the subject. But we must be very careful not to generalize out and assume that all fairies are nature spirits because some may be, or even because the ones that a certain author writes about or a certain person connects to are. The bulk of fairylore and modern anecdotal accounts from living cultures with active fairy beliefs show that these Otherworldly beings are not directly tied to the natural world but are travellers who come and go here. The best way to understand fairies is to look to the living cultures the beliefs come from. Much of what we have as mainstream or popculture beliefs, while not necessarily useless, must be understood in context to really be understood. If you want to understand nature spirits, look to the world around you and work to connect to it; if you want to understand fairies look to generations of gathered knowledge, experience, and be very careful. One of these things is not like the other. *Entire books have been written on this subject alone so I can only touch on it here but I suggest Purkiss's 'At The Bottom Of The Garden' or Silver's 'Strange and Secret Peoples' if the subject interests you. Suffice to say that some Victorian fairies did still have teeth and dangerous sexuality but the period saw a major shift in how the middle and upper class of America and Britain saw and understood fairies that has and still is effecting mainstream culture today. ** Tinkerbell was undeniably homicidal in the older source material but also unable to harm Wendy herself - she needed to trick others into doing it for her. Folkloric fairies would not have been so impotent in the same situation. There's also the famous scene where she needs the human audience to believe in fairies to bring her back to life. Tlking about different types of fairies, how do we interpret Lugh's line in the Fate of the Children of Turen where he asks his father and uncles to "gather the Riders of the Sidhe to me from every place where they are." ? After the Milesian defeat did the Tuatha join the Sidhe or is this use of Sidhe mis-translated? Its a tough passage to parse. The Fate of the Children of Tuirenn is a much later story recorded iirc in the 16th century so its possible that its referring to the Tuatha themselves coming from a point where they were already culturally considered one with the aos sidhe. Its also possible given the appearance in other myths of a distinct Otherworld separate from the Tuatha (for example Mag Mell ruled by Manann who wasn't initially considered on of the TDD) and references in some versions of the Taking of the Sidhe to the Tuatha going into the sidhe, implying the sidhe already existed (and Manannan having to teach them how to live properly in Fairy) that the people of the sidhe existed and were distinct from the Gods even in early belief. This may also be another way to view the expression 'Gods and not-gods' [dee ocus andee) that we see in some material. My own personal interpretation is that the people of the sidhe already existed and were there and the Tuatha joined them. Nymphs are not spirits. They are demi-divine beings, not immortal like the Gods. However, we do not know how long they live (hundreds or thousands of years?). There are a variety of them who dwell in various locations (water, fresh & salty; forests; mountains; clouds; etc.). A specific nymph could also have a particular nympholept to raise a cultic practice for her. I hope this helps a little with the Hellenic view of nymphs. I'm curious why you start your timeline with the Victorians? Elizabethan literature, such as A Midsummer Night's Dream, also appears to present fairies as natural as well. Do you think there's a distinction between the faeries of Shakespeare and those of the later period?